/ Need Software for ResMed Air....I think?? Need Software for ResMed Air....I think?? ResMed sent me the ResMed Air to test for sleep apnea and the current version of the software (5.2) won't allow me to connect to the device. When I hit download it says "connect air flow generator" or something like that. Anyway, I think it's supposed to automatically connect when you connect the device to the computer. Am I doing something wrong or is the software not compatible with the device? Or something else? RE: Need Software for ResMed Air....I think?? Don't select any of these unless you actually have one of these devices. Most do not have any of these. You'll need an SD card for your CPAP if it didn't come with one. It seems they are not including one anymore. There is something amiss here. I think part is in the OP. They don't send out ResScan. I think the OP means ResMed MyAir which is therapy tracking SW that you install on your computer; and it permits you to view a summary of what a ResMed machine sends via cellular to the ResMed cloud. To help answer the OP question -- exactly what is the name of the software they gave you??? We'll work it from there. The software does not automatically connect to the Airsense10... the cellular modem contacts your DME/ResMed and uploads, extremely limited data can be viewed in the MyAir web page (or app for iPhone). 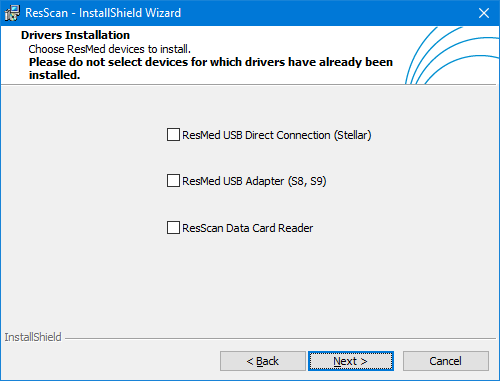 "connect air flow generator" is the error that displays when ResScan does not detect an SD card with ResMed data on it in the computer's SD card reader, or if you do not have a card reader. (06-22-2017, 09:00 PM)justMongo Wrote: There is something amiss here. I think part is in the OP. They don't send out ResScan. MyAir is web-based. No install needed. (06-22-2017, 02:15 PM)dsthompson Wrote: ResMed sent me the ResMed Air to test for sleep apnea and the current version of the software (5.2) won't allow me to connect to the device. When I hit download it says "connect air flow generator" or something like that. Anyway, I think it's supposed to automatically connect when you connect the device to the computer. Am I doing something wrong or is the software not compatible with the device? Or something else? Perhaps he's talking about the ApneaLink software (also called ApneaLink Air software)? It's ResMed's software for an at-home sleep apnea testing & diagnosis. But I'm pretty sure the version spoken about in this post is version 10.2, not 5.2. Alan: Thanks for the correction. SuperduperSleeper -- I think we have a winner. Just received a new Air Sense Auto set yesterday. Registered and set up an account for "My Air". Problem is, No signal, modem shows 1 bar and flashing blue asterisk. So my question: When does the modem connect to the cloud to transfer data? Is this a constant connection or does the modem only get a signal when polled by provider? Confused am I. Does the flashing blue symbol resemble a snowflake? It's probably the indicator that your humidifier is cooling and continues for a while after you turn off the machine. (At least that's the case with the S10) It has nothing to do with the modem connection. I usually have 4 bars but I've noticed that right after I turn off the machine I briefly have no connection, then the number of bars gradually increases. There is a significant time lag between when you turn of the machine and when your data shows up in MyAir. It can be a couple of hours. Check later and it may be there. I assume you know you need to set up an account and log in to the view the data. There should have been an instruction card with your machine. Yes, Blue asterisk is gone now. But still no bars on my machine. I did try repositioning my unit...duh. But not effective. Raised it up to ceiling level and got two bars. Perhaps I need to put the Airsense up on the roof. I guess this location is no good for that signal though standard cell phone service is great here. Almost full bars for standard Cellular Service!. Guess I need to get back with Apria to find out why this won't work here. They did not put a normal SD Memory card in this machine but I guess they rely on My Air to do the duty. Wonder if Sleepy Head can somehow interface with this setup?